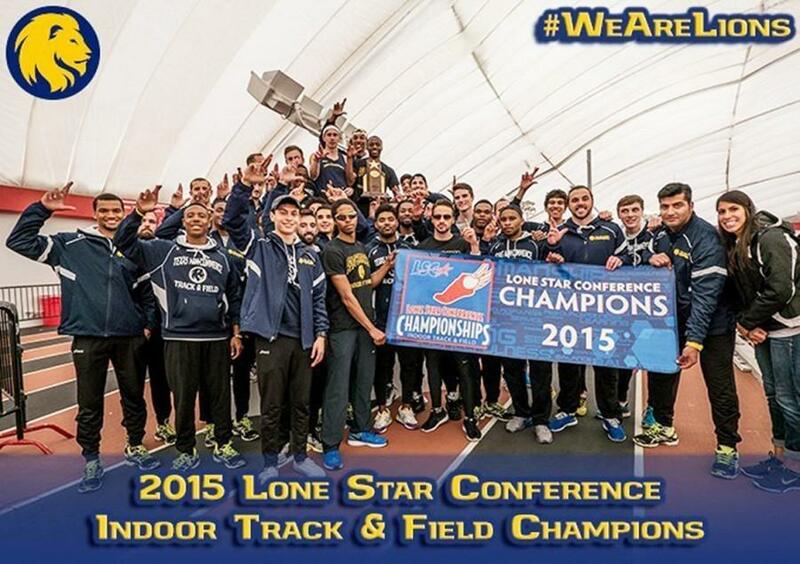 The Lions’ men track and field team won their first Lone Star Conference title in 48 years, as well as their first title in school history. The Lions, who are currently ranked No. 15 in the nation in the USTFCCCA Division II poll, took the championship by storm, with the men bringing home the title, while the women took fifth. This season has seen several records fall for the men at every event, and these events were no exception. Freshman DeVontae Steele continued his dominating season, with a mark of 17.40m in the triple jump, which is not only an LSC record, but is currently the second best mark in all of NCAA Division II. The Lions also swept the entire podium in the heptathlon, with Matt Rich, Hendrik Nungess and James Lundy doing the damage. Rich’s score of 5,249 was also an LSC best. Luis Romero had an excellent day as well, placing first in the mile with a time of 4:16.54. Romero also placed second in the 800m run and third in the 3k run. More wins came from Tyler Rambo in the shot put, with a throw of 17.26 meters. The throw is a personal best for Rambo, and is the eighth best in Division II. Dexter Lee had an LSC Best-Ever time of 48.10 in the 400m, winning the event. Lee was also part of the team of Lee, John David Rollins, Ravi Dubose and Soren Gnoss, who also took home the victory in the 4x400m relay with another LSC Best-Ever time of 3:13.65, also good enough for tenth in the country. As well as the championship, several Lion athletes received USTFCCCA Indoor All-Region selections. Lee and Dubose were honored for both the 400m and the 4x400m relay, with Gnoss and Rollins also receiving honors in the relay. Lundy was honored for his performance in the high jump as well as the heptathlon, with Rich and Nungess also receiving honors in the Heptathlon. Jamal Curtis was also honored in the high jump, and Steele was honored in the triple jump. Rambo received honors in shot put, and Masoud Moghaddam, whose throw of 20.40m in the hammer throw earlier this year, not only broke the LSC record, but is currently the sixth-longest throw in Division II. With the Lions 14 honorees, A&M – Commerce received more accolades than any other LSC team. The Lions will now head out for the start of the outdoor season, for their first outdoor meet is scheduled for Thursday, March 5, in Stephenville. The Lions will then turn around for their final bit of indoor action, with their final indoor competition being the NCAA Indoor Championships, slated to held March 13-14.